It is a black day in my life, the smell still haunts me. Wonder where he’ll come out? Ladies bathroom? 10 dollars says he’ll come out of the faucet in the girls’ restroom. They’ll start beating him with their purses and jabbing him with razor-sharp lipsticks and he’ll be helpless. the fountain was drinking him! In Soviet Russia, water fountain drink you! Heh. 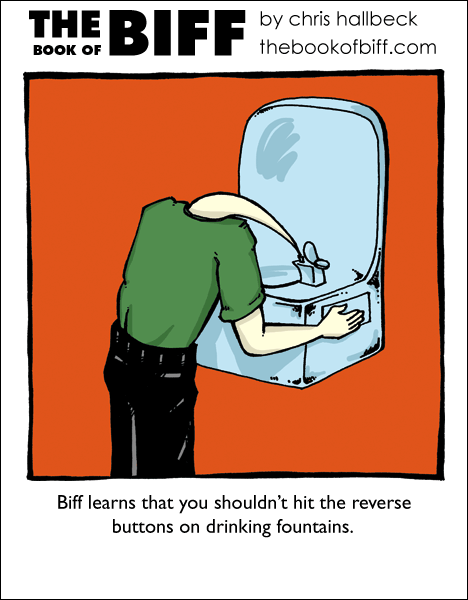 Poor Biff. He’ll be back, though. In Soviet Russia, old joke laughs at you! WOO! Whatever your on, I want some! Schlurp! Opposite day, Soviet Russia or any other causes, I would avoid that particular type of fountain. Well, that’s what you get when you put your MOUTH ON THE SPOUT. In Soviet Russia, Repeated Use Of Joke Gets You Ganked! *picked up and carried bodily away* AAAAAH! So that’s where I left my reverse button! ok lipstick aint sharp. notice the accent in the typing. giv me a hell yes if ur a southern bell 2! In soviet Russia, Biff unwelcome. The first thought that leaps to mind with this is Earthworm Jim. There wer water fountain-related injuries @ my old skool. The fountain was set into a wall with a bolt @ the top. One time akid got scared and jerked his head up. He hit his head on the bolt & started bleeding. Dont no much after that. I Came out at Biff’s House!!! Ow i`ve made that mistake before.